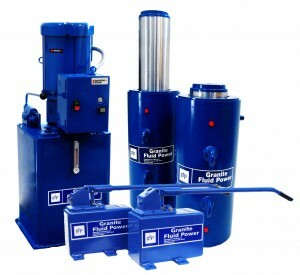 Granite Fluid Power Machining and Fabrication specializes in high pressure hydraulic components. We manufacture the Rodgers Hydraulics Task-Force line of high pressure hydraulic pumps and valves along with custom designed hydraulic cylinders, swivels, and a full assortment of accumulators. Our pumps and valves are designed for 10,000 PSI operation. We also manufacture various styles of hydraulic presses up to 600 tons with a full range of hydraulic power units to meet your requirements.